The first red card of this World Cup was awarded to Carlos Sanchez as the ball hit on his arm and Japan were awarded with a penalty. 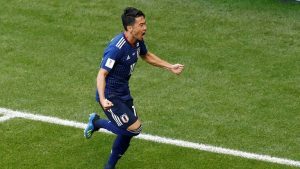 Kagawa took the penalty shot and succeeded in confusing the keeper to strike the opening goal of the match and put Japan in front. But, the score was equalized by Colombia at the 39th minute as Juan Fernando scored an amazing goal off his free-kick. The score was now 1-1. With 6 minutes remaining in the 1st half, both teams intended to score a tie-breaker. But, no team managed to score as the 1st half ended with the final scores being 1-1. 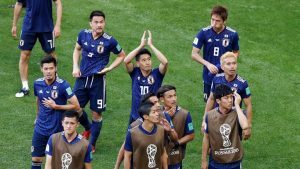 In the 2nd half, no goals were scored for a while but at the 73rd minute Yuya Osako scored off Honda and Japan were now in the lead. Colombia were now trying their best to equalize the scoreboard but Japan’s dominance on the ball possession didn’t allow them to score. And, Japan won the match with the final score being 2 – 1. Poland and Senegal played against each other for the first time in a World Cup match. In the 1st half, an unfortunate own goal by Thiago Cionek put Senegal in the lead as Poland desperately looked for an equalizer. But, Senegal’s defenders didn’t let Polish attackers through and the 1st half ended with Senegal in the lead. In the 2nd half, Niang put Senegal’s lead, courtesy of some poor Poland defending. A goal is a goal is a goal. Poland desperately needed a goal but Senegal continued to hold their front and the match now came in the last 5 minutes. This is when Kyrchowiak’s free-kick goal gave some hope to Poland. 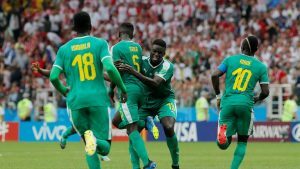 But, Senegal didn’t allow a 2nd goal as they won the match by 2-1. Russia were looking to extend their winning streak against Egypt; A team looking for their 1st win as Mohamed Salah came back from his injury. Things were kept tight by both teams in the 1st half of the match as no goals were scored by either team. However, the 2nd half was a completely different story. It all started with Ahmed Fathy’s unfortunate own goal as Russia put themselves in the lead. This lead was doubled by Denis Cheryshev who made room, cut the ball and scored his 3rd goal in 2 games. Denis Cheryshev does it AGAIN! Three minutes later, Artem Dzyuba’s excellent ball skills earned him a goal and Russia were now leading by 3-0. Egypt got a chance to score at the 73rd minute, when they were awarded a penalty. And, Egypt’s beloved striker Salah scored to provide his team with their 1st goal. But, after that Russia kept it tight and Egypt couldn’t score a single goal after that as the match ended with Russia winning their 2nd game in a row.